How does adiabatic cooling work? Indirect evaporative cooling is a method which uses the coldness of evaporation generated during the phase change for cooling (e.g., air cooling in an air conditioning system). In indirect evaporative cooling, this evaporation of water takes place on the output air side of an air conditioning device, causing warm outside air to be cooled through subsequent heat recovery. The achievable cooling of outside air depends on the amount of evaporated water on the output air side as well as the design and efficiency of the heat recovery system used. The output air can be humidified up to near saturation without an increase in moisture occurring in the input air. Apart from the speed at which air passes through the evaporative cooler, the evaporated water quantity and hence the attained cooling depend on the condition of the output air which enters the evaporative cooler. The theoretical limit of evaporative cooling is reached upon complete saturation of the air with water, i.e. at a relative humidity of 100%. Humidity increases to values of 92% to 95% are realistic in air conditioning systems at economically viable cost depending on the design of the evaporative cooler used. systemThe sensible cooling energy requirement of a building is essentially determined by the incident solar radiation as well as internal thermal loads caused by people, equipment and lighting fixtures. Depending on external air conditions and existing internal sources of moisture, latent cooling energy is also needed to maintain the permissible humidity levels. 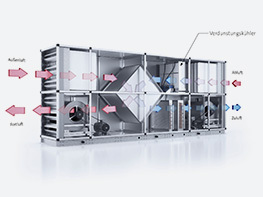 Indirect evaporative cooling is suitable for the sensible cooling of input air. In addition, latent cooling needed for dehumidification or sensible cooling going beyond the potential of evaporative cooling must thereafter take place by means of a mechanical but appropriately smaller-sized cooler. In a suitable system design, much more electrical driving energy for mechanical cooling is saved by indirect evaporative cooling than is needed to overcome the additional air-side pressure loss through the extractor fan. At the planning stage, it is possible to determine how much energy can be furnished regeneratively and actually be saved by indirect evaporative cooling by means of simulation calculation involving the operation of the air conditioning system at the respective building location. All outside air conditions present over the course of the year as well as the relevant design parameters of the air conditioning system must be included in this simulation. The energy contribution of indirect evaporative cooling should now be depicted using a sample simulation calculation for a sample building. This means that we calculate, using meteorological site data, the total work actually needed to cool the sample building and what contribution indirect evaporative cooling of the building has during the course of the year. The results can then be used as a realistic basis for correct system sizing and the evaluation of the cost-effectiveness of this efficiency measure during system design. The simulation calculation was done for the structural installation of the air conditioning device shown in figure 1, where the temperature profiles and parameters shown in figure 2 were adopted for the cooling mode. The system operates with summer compensation of the room air temperature and smooth reduction of the input air temperature. By way of example, heat recovery is carried out using a plate heat exchanger without moisture transfer from the output air side to the input air side and without leakages. 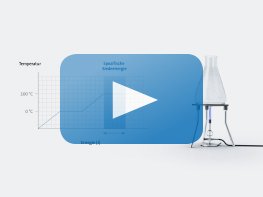 The ratio between the input air and output air volume flow is assumed to be 1:1. Minimum/maximum indoor air humidity: 40/65% rel. hum. The total annual energy contributions are calculated from the sum of the individual results determined for every hour of the year through the simulation. The calculations are based on statistical site data from the global meteorological database Meteonorm Version 6.1 for the five locations of Berlin, Munich, Stuttgart, Vienna, and Bregenz. 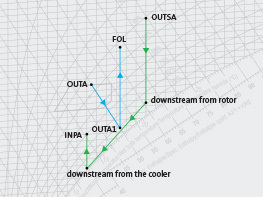 The simulation clearly illustrates the cooling work carried out during the course of the year and its partitioning into mechanical cooling, indirect evaporative cooling and heat recovery. The load alleviation which the heat recovery from the building exhaust alone produces is itself small given the selected heat recovery efficiency of 0.75 due to the low effective temperature difference during the cooling mode. However, if the additional temperature drop of the output air occurs due to indirect evaporative cooling, this leads to a distinctive increase in its energy contribution. Simulation results based on data sets for normal summers show the average energy contributions during long-term system operation, which is why they are suitable for the evaluation of achievable energy savings through indirect evaporative cooling and its cost-effectiveness. If we look at the great variations of external air conditions over the course of the year, it quickly becomes clear that refrigeration equipment must provide appropriate cooling capacity in all air conditions that arise. For this reason, simulation results based on extreme values for warm summers should be used for system sizing. If future climate conditions have to be considered on top of this, model simulations using future meteorological data sets can be carried out, provided they are adequately representative. The simulation results refer to the sample air conditioning system on 5 selected sites. The energy contribution of indirect evaporative cooling significantly reduces the cooling capacity to be provided by the mechanical cooler to cool the building. As the simulation shows, indirect evaporative cooling leads to considerable regenerative contributions. Clear differences arise in the respective weather data from the selected sites with otherwise the same system design. When there are higher air humidities in some regions, requiring more dehumidification to take place, the energy contribution there has lower prorated values. This is clearly shown in Bregenz where there is appropriate climatic influence due the direct location on the eastern shore of Lake Constance. The total regenerative proportion comes from the sum of the energy contributions of indirect evaporative cooling and heat recovery. In the selected building locations, this goes up to between 40% and 56.6% of the total cooling energy to be provided annually. The greatest hurdle when using renewable energy is in the area of cost-effectiveness. 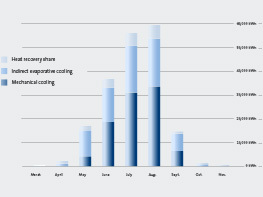 Efficiency measures such as indirect evaporative cooling must be profitable. Cost overruns during the investment phase must be recovered through targeted cost savings during operation. This balancing of accounts must take place in every building. A reliable system simulation makes the relationships transparent and allows a realistic comparison with conventional measures for cooling buildings.